-CB “Djou and Aiona have generally distanced themselves from their own party.” When Hawaii Dem Party supports their candidates with www.youtube.com/watch?v=6T6OeatngSM&feature=youtu.be, HRP leaves ours out to dry. Ask HRP what she’s doing with our donations? –Rs identified as Rs. 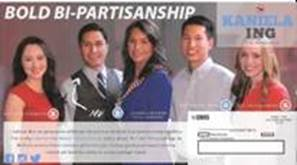 Reader “I received an 11″x 6″ postcard from Kaniela Ing (D) with pictures and political party labels for Beth Fukumoto (R), Lauren Cheape (R) and dems Takashi Ohno and Tulsi Gabbard. If the State Party officials take no action on this blatant endorsement of a Democrat by Republicans, the party might as well finish the job and close the doors and shut down the web site. A desirable alternative would be resignation by the party leaders and turn the official party back over to Republicans with principals and backbone. We know that isn’t likely to happen.“ Reader “I can’t even believe this.” The media doesn’t mention it because they like their Rs being like Ds. -Sierra Club hits Fale for being “belligerent” and “polarizing.” CB reports Fale agrees and says that’s “ironic” because he is simply a Republican clone of Clayton Hee. -Djou damaged by get-along Rs. State House Rs unanimously approved what they called a “fiscally conservative” state budget. http://hira.hawaiideservesbetter.com/enews/hira_code_blue_052213.html. HIRA called out Rs for voting with Ds. http://hira.hawaiideservesbetter.com/enews/hira_code_blue_041813.html. During debate, Takai hammers Djou with the Republican caucus vote FOR the state budget. -Rs spend two years complaining about the liberal S-A, then your candidate gets an endorsement and Rs think that’s good? 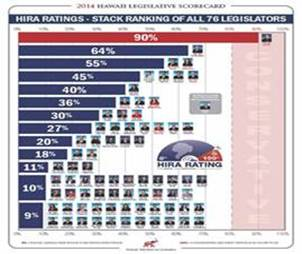 S-A editors like HD17 Ward for “bringing a moderate GOP perspective to a Democrat-dominated chamber.” HD22 Grace is “a solid alternative.” Fale is, well, they have nothing good to say about him as not one other R senate candidates receives even a footnote. They call Johanson’s go-along/get-along philosophy as ‘common-sense approach.” The major reason given to elect House Ds is their usurping of Rs = our House caucus is the biggest detriment to more Rs being elected. -You can be a lot of things but you can’t be a fiscal conservative if you support “the Akaka bill, ongoing efforts by the Obama administration to engage in rule-making or an executive order to give federal recognition to a phony Hawaiian tribe, the Kana’iolowalu process to create a state-recognized tribe, and race-based government entitlement programs (there are more than 850 of them for “Native Hawaiians)” and the Hawaii secessionist movement. Conservatives don’t support growing government, increasing taxes, or race-based initiatives. -If you didn’t read about our candidates here, or from HIRA, or see them at church-sponsored forums, you wouldn’t hear of them. Ask HRP to tell us (honestly) who are our candidates, why they are running and what are their platforms (in the absence of a party platform). – What you want and why you want it. This cycle is ALL about winning the US Senate. Everything else is a distraction. You want Ds to spend money in Hawaii to the detriment of mainland Senate races. You don’t want Rs spending money in Hawaii. (An example is Ds sending an emergency $200k against Djou.) When HRP begs $ from national cmtes, they’re not on the R team. Locally, thank you to our candidates. By now, we know who may win, and who won’t. Local races can be won… if HRP focuses on the 2-3 winnable races. You want HRP to focus on winnable races. -HRP’s misplaced focus on Aiona’s campaign, sacrifices the race they could win. Aiona is behind Ige, Djou is ahead or tied with Takai. Well after early voting began, HRP finally assists Djou (Saiki and Djou whining about the Dems whining.) This lack of leadership and disciple could cost the win, but may be what Djou desires – for HRP to stay away. -Watch, with total raised/CoH in thousands. S23 Fale 51/38 vs Riviere 53/8. H22 Grace 26/5 vs Brower 14/0. H27 Fowler 66/16 vs Ohno 59/5. H43 Tupola 43/4 vs Awana 24/3. H47 Pouha 24/4 vs Fonoimoana 25/13. HNL Council IV Waters 174/27 vs Ozawa 140/23. OHA Ahu Isa vs Trask. -CSC reports. Money isn’t everything, unless you don’t have it. Ds raise money, Rs don’t. Some Rs came on strong – Valenzuela, Yoder, Hikida, Kaapu, Tagville, Kukahiko and the incumbents. A third of HRP’s candidates failed in fundraising. Less than $15,000 – Manutai, Marshall, Kamaka, Lethem, Thomas, Bateman, Kapoi, Franks, Agustin, Svrcina, Jeremiah, and Moses. Less than $5,000 – Mathieu, Pohle, and Hoomanowanui. Amsterdam, DuBois, Danner, Dickson, Ku, Marten submitted no records or raised virtually 0. House leaders, Ward and Johanson, finally provided a few candidates some assistance. Nonaka on as many D campaigns as R. Many R candidates still using liberal PIRYX. HRP soaking candidates for copier use, even $1.13 for one job. -Saiki has RNC money, RNC staff and resources. No excuses. -Following last report that Nonaka works both sides, sort of AC/DC, the media tweaks their romance and refers to him as ‘political’ consultant, rather than ‘Republican.’ Thank you. -There is no discernible difference between Hawaii D and R candidates. Instead, we want for principled politicians, whose principles are our principles. –Maui R candidates are afraid to attend Hale Mauka forum. County chair Fontaine isn’t in the loop (HRP doesn’t provide contact info) or working with candidates. –Common Core/Pono Choices is THE grassroots issue. As Lingle stumps FOR Common Core, Aiona is noncommittal and Djou doesn’t say. McDermott is fighting for you. -HR’s Zimmerman is national with http://watchdog.org/177834/hawaii-ranks-worst-for-tax-burdens. –Improving. CNBC ranks Hawaii 49/50 for Top States for Business. That’s up from 50/50 last year. -NRA dinner http://hawaiirepublicanassembly.com/enews/NRAporter_veterans_dinner_092214.html. NRA protects your civil (gun) rights only if you support NRA. Join www.nra.org. Plan to attend the Annual Meeting, Nashville, April 2015. Last five: What’s Wrong/ Primary Success/ Primary/ Changes/ Convention. Not my posting but tells the real story = HRP transparent at www.hawaiideservesbetter.com.